You are preparing a list of items for your upcoming shopping. Once you started listing down your items in a row in Excel, you thought of highlighting certain items from the list. You have just started using excel and are not aware of most of the tools or techniques that might help in solving your problem. You came across the solution of highlighting the items by changing the font color, background, changing font style or changing the dimension of the cell. Well, these are some of the basic excel features which are very useful in our day to day activities. 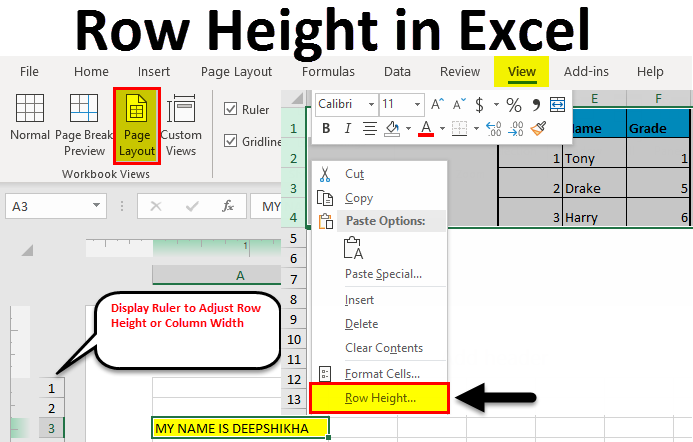 Microsoft Excel provides a basic feature of modifying the Excel row height or Column width. Using this simple feature one can resign column or rows precisely. Rows have a maximum height of 409, and the column has a maximum width of 255. The default row height is determined usually by the font size. 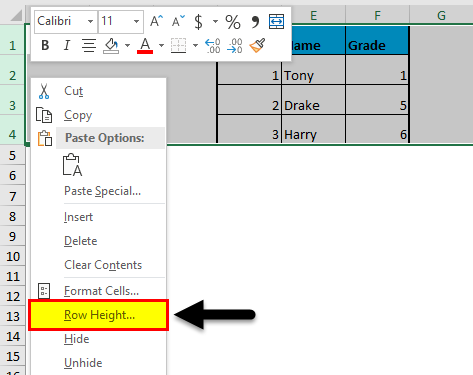 If you make any changes in the font size excel automatically adjusts the cell row or column either taller or shorter. If the text that you have entered is in Times New Roman font style in Excel 2013, the row height is default 15 points. This row height varies depending on the display scaling (DPI) from 15 points on a 100% dpi to 14.3 points on a 200% dpi. One can also set a row height in Excel manually, starting from 0 to 409 points. The cell having row height equal to 1 point is approximately 0.035 cm whereas the height of a hidden row is zero. In the Home tab under the format option, you can adjust the row height or column width. You can manually set the Row Height option whereas Autofit row height will adjust the height automatically based on text or font size of the cell. This is the easiest and quick way of adjusting the row height by dragging the row boundaries with the help of the mouse. 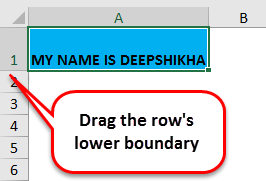 If you want to change the size of one cell, drag the lower boundary of the row until you get the desired height. For changing multiple cells, first, select the rows for which you want to make changes and then drag the boundary of row heading. This option provides the user to change or set the row height to a specific point. Choose the format option from Home tab ribbon, click on Row Height. In the row height box, type the specified value of the row and click OK. There is also a shortcut way of getting the Row height dialog box, Select the rows of your choice and then right-click, select Row height from the drop-down menu. Sometimes you may have come across the situation, wherein you have copied any text in the cell and you are not able to read the text properly as the text is clipped off. The row height needs to be fixed using autofit row height option. This will allow the row height to adjust automatically using the largest value of that row. Double click on the lower boundary of the row heading to adjust the row height of the entered text. Select the row A3, go to Format option and click on Auto-fit row height option. The row height of the text will get adjusted automatically. 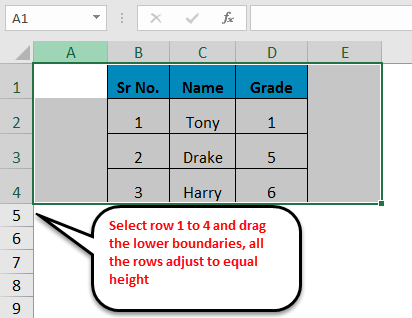 Note: To Auto fit all rows of the excel sheet, press select button (Ctrl + A) and then do double click on the lower boundary of any two-row headings or click on AutoFit Row Height option from the format menu available in the home tab ribbon. 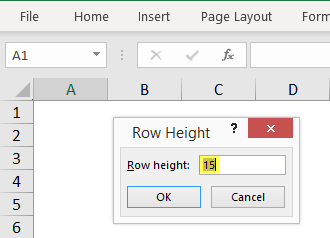 Sometimes when there is a need to take print out of our excel working, we need to set the excel row height based on inches and this can be done using the Page layout option. In the View tab, select on the Page layout option. This will display the rulers which allow you to adjust the column width or row height in inches, centimeters or millimeters as per the requirement. Select either one or multiple rows of the excel sheet and set the row height by dragging the lower boundary of the selected row headings. 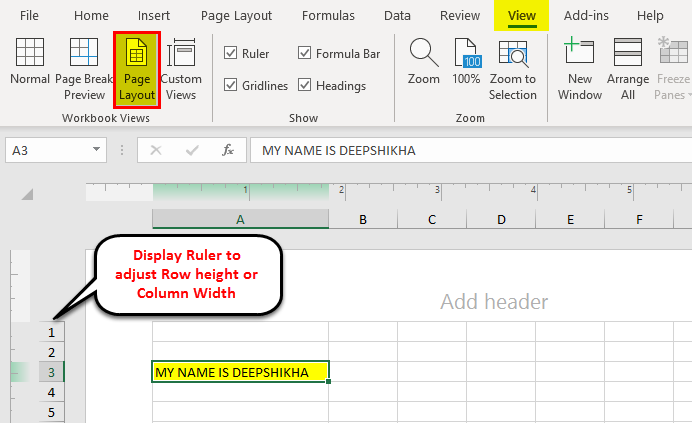 Excel grid sometimes appears to be static in nature, but you can customize the page layout using the Excel tool of row height or column width. The easiest method of adjusting the rows is by dragging the Mouse up or down. To get the specified row height you can use row height option under the format menu. To resize the whole dataset, select the entire sheet and click on the Auto-fit option. This sets the required rows/column automatically. If a user wants to customize the sheet, use the page layout option and adjust the row height in either inches, centimeters or millimeters. It’s the most effective and simple technique which is useful in our daily activities. How do you Autofit Text in Excel?